Apple has announced that its new iPad Mini with a Retina Display will be available starting Tuesday at Apple’s online store. The tablet, which was announced last month, still has a smaller 7.9-inch display than the full-size iPad, but now that display has significantly better resolution. The 2048 x 1536 resolution screen is much crisper, making photos, videos and text appear sharper. The tablet starts now at $399, rather than the $329 the original Mini cost. However, Apple is still keeping that original, lower-resolution Mini on shelves for $299. Apple’s senior VP of marketing Phil Schiller noted the iPad mini might be supply constrained, at least initially. “We think customers will love both of these thin, light, powerful new iPads, and we’re working hard to get as many as we can in the hands of our customers,” Schiller said in the press release. When the new iPad mini was announced, many were expecting that Apple would bump up its specs from the first iPad mini, and give it the A6 chip, which would’ve been fine for most people. Instead, Apple went above and beyond, giving the new iPad mini the A7 chip that features 64-bit architecture as well as the M7 motion co-processor, giving it as much functionality and power as its larger sibling, the iPad Air. Except, it costs $100 less, starting at $399. Apple explained that it wants all of its latest and greatest features available to all of its customers. It’s certainly not holding anything back with the iPad mini with Retina Display. 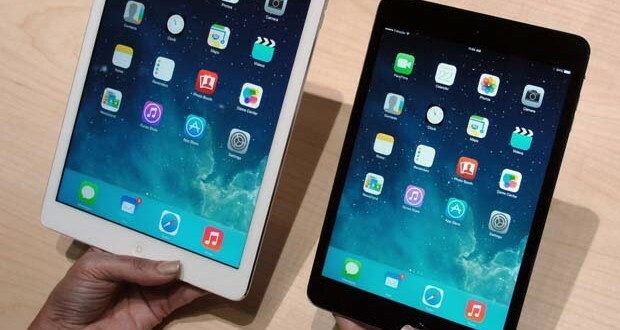 CEO Tim Cook has said that he expects it to be an “iPad Christmas,” when the iPad Air and iPad mini with Retina Display are combined. Judging by the reviews of the iPad Air and the specs and display on the mini, I’d say that’s more than likely. Apple did not release iPad Air sales figures for the first weekend that it was available, but may wind up doing so this weekend, now that both tablets are available, at least online. Now the only question that remains: can Apple make enough to meet demand?